La sensibilidad se lleva bien con los luchadores?Desde su debut, el Conde de Terciopelo se ha empe ado en demostrar que no hay luchador m s rudo que l. El ring no es un lugar para d biles, el chiste es apabullar a todos para llegar al estrellato. Pero, la verdad, el Conde es de naturaleza sensible, y su carrera podr a irse a pique por eso. Lo que pasa es que desde chiquito le ense aron a aguantarse como los machos y cosas por el estilo. ltimamente le afecta lo que la gente piense de l, su enemigo ac rrimo le hace burla y, para colmo de males, la ni a que entrena a su rival ha descubierto su punto d bil y est maquinando un mal volo plan contra l.Acompa a al Enmascarado de Terciopelo y sus amigos en su intento por no perder su encanto personal sin dejar de imponerse en las luchas.ENGLISH DESCRIPTIONIs being sensitive ever a good attribute for wrestlers to have?Since his debut, Count Velvet has been determined to prove that there is no wrester tougher than him. The ring is no place for the weak; the idea is to crush everyone and that way rise to stardom. But truthfully, the Count is of a sensitive nature, and his career could go downhill for that reason. Since he was little he was taught to be brave like a man and toughen up during difficult situations.Lately, what people think of him is affecting him, his bitter enemy makes fun of him and, to make matters worse, the girl who trains his rival has discovered his weak spot and is plotting a malicious plan against him. 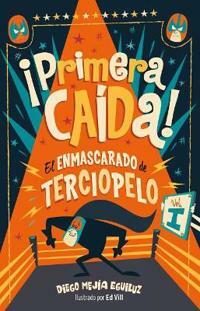 Come along with the Velvet Masked Wrestler and his friends as he attempts to win his matches and not lose his personal charm in the process.